Type !start to choose your starter. Type !poks to see all of your Pokemon. Type !use [Number] to let the bot know that you want to use this Pokemon for battles, it will tell you that you can also use !select but that’s only needed for 6v6 Pokemon battles with players. Type !s to find a Pokemon in your location. Type !f to fight it with your currently used Pokemon. To catch Pokemon, first you need to buy some Pokeballs, type !shop, that will show you that there are 2 shop sections, the one you want is !shop 2 which is the Pokeballs section. It will show you what command you need to do to buy each Pokeball, you start with only 200 Gold, so it’s recommended to buy just a few regular Pokeballs, type !buy 101 5 – to buy 5. 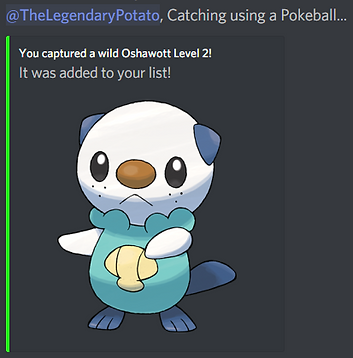 After you bought some Pokeballs, spawn a few Pokemon using !s until you find one that you want to catch, fight it until it’s health is the lowest you can get it to and then type !c 1 to try to catch the Pokemon using a Pokeball (1), if you catch it you will be able to see it on your list using !poks, if you dont catch it, make sure it’s health is low and just try a few more times. If the Pokemon’s health is full, you wont have any chance to catch it with a regular Pokeball. You can use !daily to get 6000 gold every day + and for every day you do it in a row you get even more (up to 48,000 or 66,000 with Premium)! That will help you a lot specially when you start. Type !help to see more commands!